A horse back safari in Africa is so much more than a ride through the bush - it is a completely unique and all-encompassing wildlife safari experience for both novice and expert riders, and for both young and young at heart. On horse back, the African savannah embraces you wholeheartedly and offers a glimpse into the tranquil yet unrelenting world of Africa’s wildlife. Horse back safaris are becoming more and more popular as an alternative to other forms of safaris like game drives and guided walks, and there are many who would not head out into the African savannah any other way! Our itineraries below offer an example of some of the horse back safaris available or we can tailor-make a horse back safari to suit your specific interests, budget and requirements. Horse back safaris in Africa come in many forms from half and full day rides to multi-day riding safaris either on set trails or, for the ultimate in adventure and independence, an exploratory style horse back trek where the riding group blazes its own trail through the stunning African wilderness. All levels of riders are accommodated – those who have not ridden before, lapsed or infrequent riders, experienced horsemen and women and those with advanced equestrian abilities. Some horse back safari outfits even cater to non-riding partners and friends, and also children. 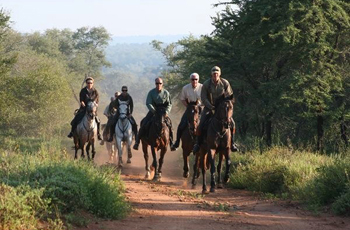 Whatever your riding ability, there is an African horse back safari to suit everyone. 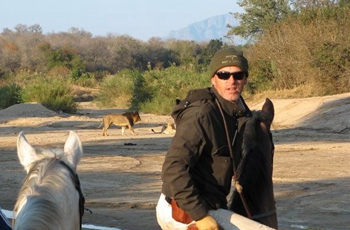 Riders are paired with a mount suitable for their riding capabilities and safari horses are well trained, with many years of bush experience allowing them to feel calm in close proximity with big game. The height of a horse is just perfect for safaris providing a fantastic vantage point ensuring unimpeded views, yet still close enough to the ground to be able to observe the smaller details such as animal tracks. Your guide, who should be appropriately trained and experienced, will lead the way but you still have the freedom to manoeuvre your horse in the way that you wish. A safari on horse back enhances the sights, sounds and smells of the bush and riders feel completely aware of their environment and are able to explore areas where game drive vehicles and walkers are unable to venture. Plains game consider a horse to be ‘part of the family’ and, as a rider is seen as part of the horse, herds of wild zebra, buffalo, giraffe and antelope will feel relaxed in your presence and allow you to ride close by and even as part of the herd - an impossibility in a game viewer or on foot. So, if you can picture yourself trotting alongside a giraffe, cantering in unison with a herd of zebra, watching a rhino grazing from just metres away, or galloping across the wide open African savannah, then you best give us a call and we will help you plan the African horse back safari of a lifetime!